paid for a gym membership, and then not gone for months? signed up for a 30-day free membership, and then forgot to cancel? continued to pay for a service that you stopped using a really long time ago? Unfortunately, I have been guilty of all of these. That's what attracted me to Trim. Trim started as a way to cancel subscriptions that you no longer use. The founders recognized that automatic renewals and small unnoticed expenses were adding up to a substantial amount of money. They wanted an easy way to recognize and then cancel these expenses. 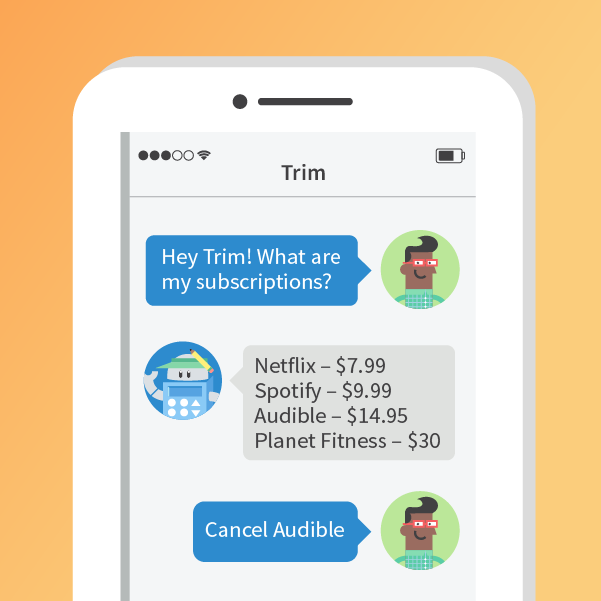 Trim started as a way to cancel unwanted subscriptions, but today Trim does so much more. 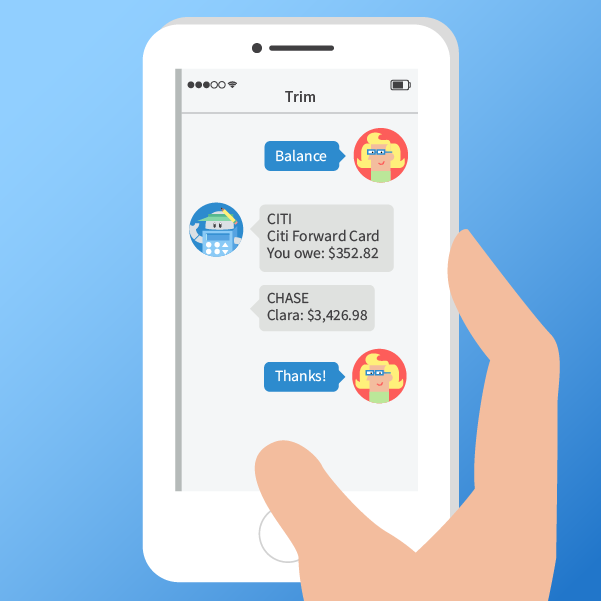 Trim is described as a “personal assistant that saves money for you”. To date, they have helped users save over $8,000,000! Trim is insanely simple and easy to use. You sign up for Trim and securely link it to your credit cards and bank accounts. Trim will analyze your accounts looking for recurring subscriptions and determining opportunities where you can save money. You are then sent notifications of savings opportunities via Facebook Messenger or SMS text. Cancelling an unwanted subscription is as easy as texting “Cancel ______” back. They will contact the biller on your behalf, usually through a template email, and sometimes through a phone call. Some billers will require more work, for example, they will send certified mail to cancel your gym membership. Continue reading to find even more useful features. How much does Trim cost? They charge nothing to help you cancel your subscriptions and save money. Trim makes money in two ways. Through third-party partners, like credit card companies, when you are referred to them. How can Trim save you money? Link your cable or internet bill and Trim will negotiate to save you money. They scan current promotions and discounts and then work on your behalf to get you a better deal. I linked my Comcast account to Trim and it saved me $5 a month. Since I only have Comast for internet, and not TV, $60 a year is a big savings to my bill. Update: Since starting Trim renegotiated with Comcast and saved me another $39.09 off my monthly bill! Plus they got me a $50 one-time credit for outages! That means that Trim will have saved me $579.08 on my Comcast bill alone! Wow! Currently, the number of providers that they work with is limited, but they have plans to expand. Today Trim works with Comcast, Time Warner, Charter, and a few others. Many subscriptions are small enough that they are easy to forget or too bothersome to take the time to cancel. Who has time to go through all their credit card and bank statements? With Trim, it's as easy as sending a message or text that says “Cancel _____”. I haven't used Trim to cancel any subscriptions yet, but I know that I can. Since I keep close tabs on my monthly spending plan, there are unlikely to be many monthly subscriptions that warrant canceling. However, Trim keeps monitoring my transactions, so if an annual recurring expense pops up, I will be notified. If you have a Visa credit card, Trim can find relevant cashback deals and activate them for you. They automatically look for discounts and coupons at the merchants you use and then apply those deals to your card for you. I haven't used this feature yet. Some credit cards have a “Price Protection” perk, which gives you money back if the price drops for an item you have purchased recently. Most people don't use their Price Protection because it's a pain. They have to constantly track the prices of things they bought and then file a bunch of paperwork to report the price drop. Trim's Price Patrol feature takes all of the work out of Price Protection. They find the price drops and prefill the forms that need to be filed. I tried this out with my Amazon purchases from the last 90 days, and it saved me $48! Not too shabby. Trim can send you notifications and help you monitor your spending. Receive alerts based on large transactions, payday, late fees, and minimum balances. Never have another overdraft fee because you can check your account balance with a simple text of the word, “balance”. Trim doesn't store any of your bank or credit card information. They use 256-bit SSL encryption and require two-factor authentication to verify your identity. They also provide read-only access to your transaction data, so money can't be moved and changes can't be made to your account. Despite how incredibly awesome I think Trim is, it has some areas it could improve. You will definitely need to personalize your alerts. I had to adjust some of the alerts so that I wasn't receiving 3-4 texts a day. Low balance, late payment, and payday are nice, but balance updates and credit card usage alerts are too much. The good news is that you can adjust the alerts to your individual situation. They could improve the number of merchants and utility providers they work with. Relationships with Comcast and Amazon are great but adding cellphone carriers and other frequent services would be a big win. It sounds like this is in the pipeline, but as of this writing, not available yet. The feature to get a better credit card isn't perfect. It estimates my rewards based on what I might have spent in the last year. Unfortunately, the estimate is based on a total amount and it doesn't compare potential “better cards” to my existing ones. As far as features go, this was the only one I found lacking. But since I am not a huge fan of having multiple cards, and I don't really want another credit card, it's not a big deal. Why pay for services you don't use? That's just throwing money away. Trim helps you to capture those wasted dollars. And they have helped others save over $8,000,000! Trying Trim out is free. So what do you have to lose?